Central Finance brought you a Budget Hire/ Rent a car services islandwide for an affordable price of Rs. 1,450/- per day. 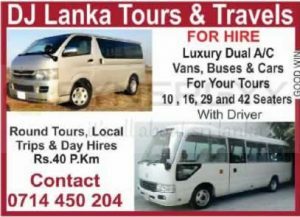 Now you can hire your rent a day from Colombo, Kandy, Nuwara Eliya, Jaffna, Galle, Badulla, Panadura and Anuradhapure. #270, Vauxhall Street Colombo 2. 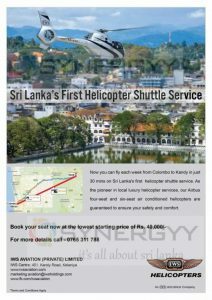 Arrow Taxi introducing new facility of office shuttle services to Kandy on Friday evening 5.30 Pm from Colombo Fort. 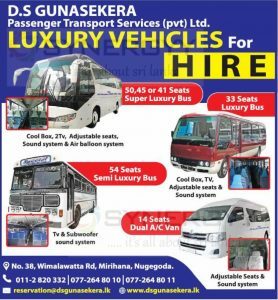 Leading transport service provider of D.S Gunasekera, brought you range of transport solutions from small air conditioning van to big 50 seater bus at an affordable price. 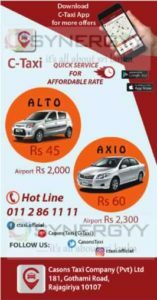 Carson renowned rent a car company starts their own taxi services with Suziki Alto and Toyota Axio at a special price. You could enjoy trouble free taxi service of Carson taxi service for Rs. 45 per Km for Suzuki Alto and Rs. 60 per Km for Toyota Axio. Carson taxi offers airport taxi service for Rs. 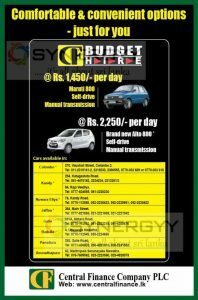 2,000/- with Suzuki Alto and Rs. 2,300/- with Toyota Axio. 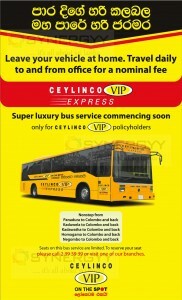 Ceylinco VIP on the spot insurance made revolutionary changes in Insurance industry by introducing a Ceylinco VIP Express Super Luxury bus service for their policy holders. Seats on this bus service are limited. To reserve your seat please call 0112 39 39 39 or visit one of our branches. Commercial Bank announces a special promotion of discount upto 50% at selected jetwing Hotels in February 2016. 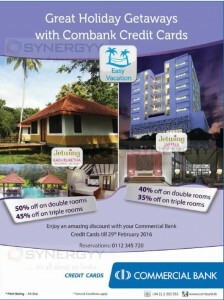 Jetwing Kaduruketha and Jetwing Jaffna are those selected hotels entitled for the special price in this season. 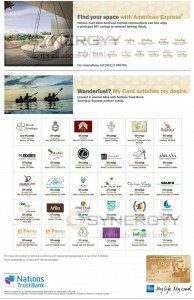 www.findmyfare.com announces a special 50% off on book the Exclusive Avurudu Season Hot Hotel Deals & Enjoy Massive Savings! Prices are starting from Rs. 3,200 per person. Offers are valid from Cinnamon Hotels & Resorts, Heritance Hotels & Resorts, Avani, Jetwing Hotels, Amaya Hotels & Spa, and 100 Hotels. The government has drawn attention to utilize Ratmalana airport for inland civil passenger transportation. Ports Shipping and Aviation Minister Aijuna Ranatunga said. 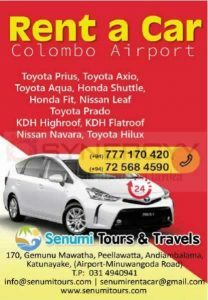 The government will look into possibilities to carry out inland passenger transportation from Ratmalana airport as far as such activities do not affect the national security, Under this, flights will be operated to inland destinations such as the North and East. South and a few other tourist destinations. Aviation authority has already discussed to conduct flights to tourist destinations with inland tour and airline operators. However, priority will definitely be given to the national security since it is above all other activities. 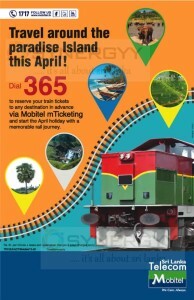 Are you getting ready for your April Holidays to tour around Sri Lanka, plan your tours with Srilanka Railways and book your tickets by Mobitel. Dial 365 to reserve your train tickets to any destination in advance via Mobitel mTicketing and start the April holiday with a memorable rail journey. Rs. 8/- per minute + taxes and reservation charges + ticket charges apply. 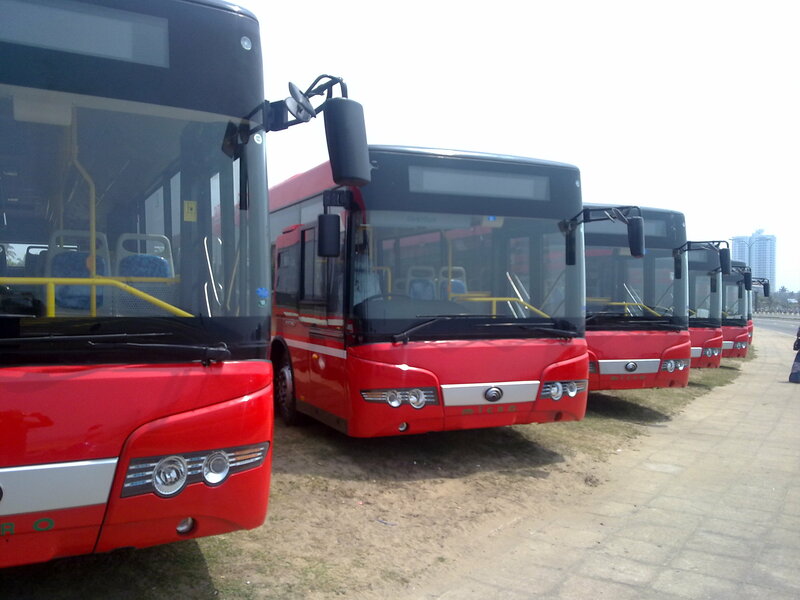 The Transport Ministry is making arrangements to set up CCTV cameras in all private buses and Ceylon Transport Board (CTB) buses, Internal Transport Minister stated in news. At present, the number of complaints received by the ministry and the CTB on inconveniences encountered by passengers inside buses are rapidly increasing. Violence against women, passengers not obtaining balance money, not offering seats to differently-abled persons, pregnant mothers and clergy, etc are some of the complaints. Railway passengers in Sri lanka would be able to enjoy free Wi-Fi facilities at some 100 selected railway stations in the country by April, the Railway Department said to news. Under this programme Wi-Fi hotspots are due to be established in over 100 stations around the country with the support of Sri Lanka Telecom which is a leader in Telecommunication in Sri Lanka. Railway Commercial Superintendent stated to media that “We are going to begin this programme next week from the Fort Railway Station. By April, there will be almost 100 railway stations with free internet access which enables passengers to access internet via smart phones or tablets”. And the infrastructure facilities for the project are still being constructed by the Railway Department in the selected railway stations. Athukorala was the seventh Chairman of the Sri Lanka Export Development Board (EDB), the only Chairman to serve the EDB for over five years, and supported the industry in taking the export revenue from US $ 6 billion to US $ 11 billion in his tenure. The New Tourism and Sports Minister Navin Dissanayake has invited the leading French TV channel NT 1 from France to film and telecast the prime time TV programme ‘Bachelor’ (French version) in Sri Lanka in line with the global trend of marketing tourist destinations via film tourism. Episode 1-2 is to be filmed in Spain, 4-5 in Paris, 6-8 in the Alps and episode 9-10 in Sri Lanka. This is a big win for the country and we must pursue this strategy as a public-private partnership project as the beneficiaries must be the private sector Minister Naveen Dissanayake said. The Chairman of the Sri Lanka Tourism Promotions Bureau Rohantha Athukorala commented “The programme Bachelor (French version) attracts a viewership of 1.3 million in France and as the minister mentioned it commands a prime time belt. Sri Lanka Airlines offers 30% off to Srilankan online destinations for Student Visa Holders and 20% off to other passengers. As the official carrier of EDEX 2015, we also offer students an exclusive 40kg baggage allowance when flying to Srilankan online destinations. National Transport Commission announces the new bus fare revision after the fuel Price reduction in last week. The below Fare reductions will be implemented from 1st February 2015. 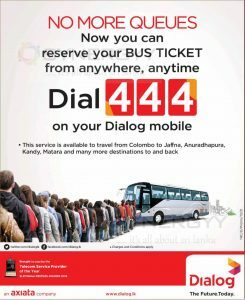 The starting bus fare has reduced by Rs. 1/- from Rs. 9/- to Rs. 8/-. 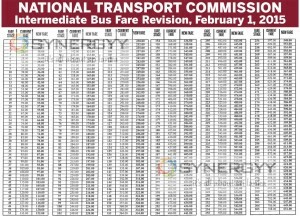 See below image for the details bus fare reduction from 1 to 305th Bus fare stage. 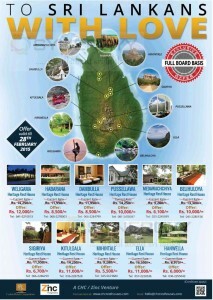 Ceylon Hotel Corporation a leading hotel chain in Sri Lanka offers wide range of hospitality services in Sri Lanka, the Corporation offers a special promotions for the Srilankan travelers to enjoy the world class hospitality at an special prices till 28th February 2015. Visit the SriLankan Airlines stall at EDEX 2015 and register! BMICH, Colombo from 23rd to 25th January 2015and Kandy City Centre on 30th and 31st January 2015. Explore new possibilities in more than 130 destinations around the world. Cross one off your wish list with Qatar Airways’ great fares with discount upto 30% off. To book your ticket Click Here or contact your travel agent. Seats are limited and subject to availability. Blackout dates apply. Please review other terms and conditions at the time of booking.